You can tell it is the off-season. News is fairly scarce, unless you are Aaron Hernandez. Research is slow, unless you’re a Georgia Mutt awaiting the next suspended player or arrest of a Clemson player. So, I figured with a recent commitment to the Gamecocks, I would do a quick recruiting update. Ready, Set, Go! All star ratings are based on Rivals.com. Jhaustin is a big fan of Muscle Milk – the official sports drink of big ears and angry scowls. Photo via. Out of these eight players, I am most impressed with Bryson Allen-Williams. Not just for his abilities on the field, but for his seemingly limitless commitment to the University of South Carolina. He’s already acknowledged that most think he is undersized, and has already bulked up to 228 pounds. Outside of his efforts to be college ready, he is a great recruiter. Seriously, Coach, we need to get this guy a job as a recruiter after his playing days are over. He is always talking to prospects, and helped us land a 2015 recruit from his school. 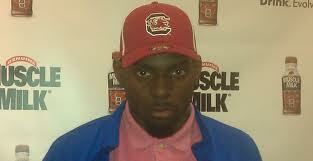 He’s very intelligent, and has a high football IQ, he will be a great player for the Garnet & Black. Underrated Player Award goes to Malik Young, from what I hear he hasn’t really camped much, which is what has lead him to be ranked so low. Most disappointing loss this recruiting season so far would have to be Drew Barker to Kentucky. We led all the way until iJoker got iFired. Once he was out, the new coaching staff started pursuing and that was it. Kentucky was his favorite school, he’s from Kentucky, once they offered then it was over. Can’t blame him for wanting to play for his home state school. I still want us to register 20 sacks on him over his career. Sorry, Drew. Joe Blue is a fullback, I’ve heard rumors about him converting to Linebacker, not entirely sure right now. Two four star tight ends make me feel very good about the future at that position. Maybe more two tight end sets? Who is left on our board that I feel is a MUST GET… I have to go with Derrell Scott, a speed back that can hit the edge and blow by. MUST GET. See this, Coach? Shout out to Bryson Allen-Williams for the commitment to the University, and helping draw in some other big time players! 24 years old. E-Book writer. SC Football article writer. I'm from a small town right outside of Columbia, SC. Posted on June 27, 2013, in Blog, SEC, South Carolina Gamecocks and tagged Recruiting, South Carolina. Bookmark the permalink. Leave a comment.